Welcome to today's edition of Nerd Alert, where we have all the quirky, nerdy news that you crave in one convenient spot. What do we have in store for you on this wonderful Wednesday? The Martian gets an honest trailer, teenagers react to the first Captain America: Civil War trailer and seven things you didn't know about Back to The Future. But wait, there's more! A new Google Chrome filter will block every mention of Donald Trump and Star Wars: The Force Awakens villain Kylo Ren gets a new parody video. Sit back, relax and check out all that today's Nerd Alert has to offer. Star Wars: The Force Awakens is now a verified blockbuster that has reinvigorated the fans' fervor for this franchise, under the direction of J.J. Abrams. 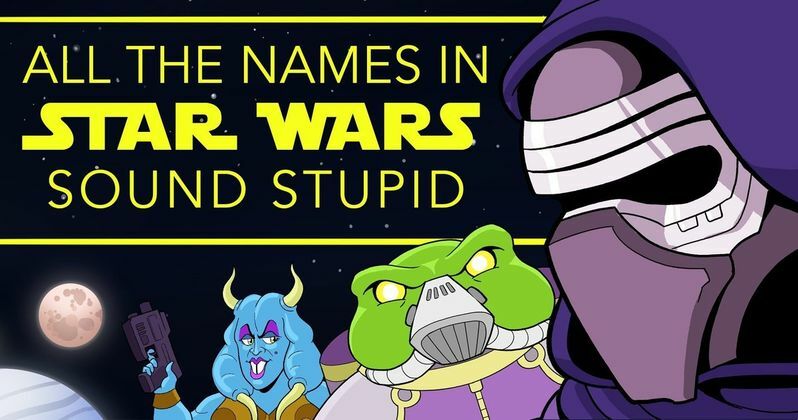 One of the many franchise traditions he upheld is the use of bizarre names, which College Humor explores in a new animated parody. The video shows Kylo Ren explaining to the First Order that he needs to put a team together to crush the Resistance, but he finds himself obsessed by how "stupid" all of their names sound. If you've ever chuckled after hearing the name Bib Fortuna, then this video is right up your alley. The First Order Stormtrooper TR-8R has become a cult figure in the weeks after the release of Star Wars: The Force Awakens, with a unique baton that he uses to fend off Finn (John Boyega). If you've been wondering how to construct your own version of this "riot baton," then Controlled Choas has you covered, with an extensive four-minute video that shows you how to construct this unique weapon. Screen Junkies is back with their first Honest Trailer of 2016, delving deeper into Ridley Scott's blockbuster The Martian. Much like an entry from last week's Nerd Alert, this honest trailer pokes fun at the fact that Matt Damon's characters often need to be "saved" in his movies, and his character Mark Watney is no different. This five minute video pokes fun at all of the resources Mark has at his disposal while stranded on the Red Planet, and much more. It's been just over a month since the first trailer for Captain America: Civil War has debuted, with many fans getting ready for the highly-anticipated May 6 release. Fine Brothers Entertainment gathered a group of teenagers as part of their React series, where they all watch this footage for the first time. Several of these teenagers knew what the movie was right away, while others wondered why this is a Captain America movie and not an Avengers movie. It's a fair point, since almost every main character from Avengers: Age of Ultron is present in Captain America: Civil War. It's interesting to see what these youngsters are excited about, and what confuses them about this footage. Before 2015 came to a close, the fine folks at Cinefix decided to put together a "sequel" to their original Back to The Future video, presenting seven more things you didn't know about this 1985 classic. In case you missed the first video, you can also check that out above. It was a great year of celebrating this iconic movie, and these two videos ring out 2015 in the right way. Even if you haven't been following the 2016 Presidential race too closely, you'll certainly know that Donald Trump is one of the Republican party's front-runners for the upcoming election. The entrepreneur and former Celebrity Apprentice star has been getting constant coverage from the media, but if you're sick of seeing his name all over the internet, the web browser Google Chrome has a solution, the TrumpFilter. The new Google Chrome extension will block every mention of his name from the Internet, with three different settings, mild, aggressive, and vindictive. The extension is preset on mild, where Donald Trump's entire Twitter page goes blank, but the highest setting, vindictive, blocks entire news sites such as CNN, Google News and even InStyle. You can download the app at the Google Chome Store. Screen Rant has a new video breakdown that explores 10 movies that "stole" iconic sound effects, including the often-used Wilhelm Scream. This video also shows how Steven Spielberg re-used a sound effect from his first film Duel for his iconic masterpiece Jaws, and much more.